Somehow, I managed to get the whole family out for this one - my kids seemed pretty excited by the whole thing. They ran their first "kids run", a half mile out-and-back course, and then trick-or treated the booths with my wife while I did the 5K, a couple laps around the GSR. Here we are beforehand - Spider-girl and Lt. Commander Data (hence the expressionless face.) I recycled my Magnum P.I. costume from Tough Mudder a couple years ago. The kids race went off first, and it was hard to pick them out in the pack of colorful costumes. Barely got a shot of them over someone's shoulder. And another minute or so and my two came through. Data there had to put on a burst of speed to stay in front of his sister. 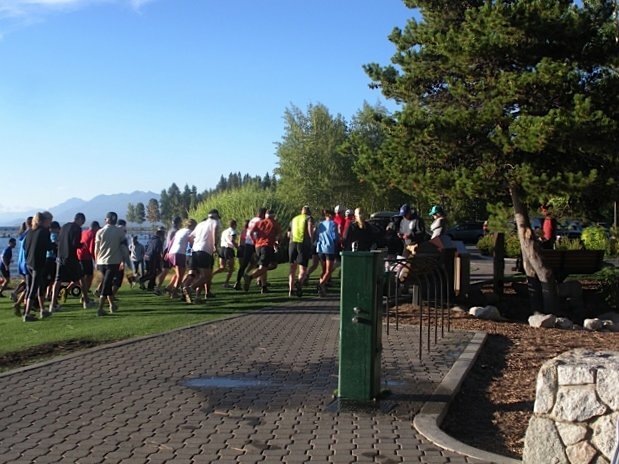 It was finally getting dark by the time the 5K headed out, and we followed a line of plastic pumpkins and volunteers dressed as zombies for a couple laps around the Grand Sierra Resort. Got some funny looks from people at the driving range the first time by, but the were used to us on the second lap. I started back in the pack at the start, so got to pass a bunch of people on the first lap, then settled in for the second one. It probably wasn't a great idea to push it as hard as I did, on the little running I've been doing - definitely felt a little headachey and off afterwards. But my ankle seemed to hold up - although that may have just been the adrenaline of being in a race environment. I'll test it out further later this week. Finished around 22:15 - I didn't wear my watch, and it was chip timed, so still awaiting results. 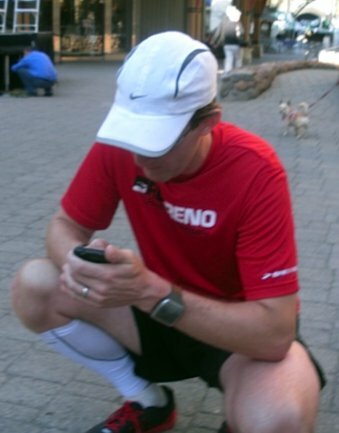 Fun race all-around, though - Reno 5000 puts on a good show. I think the turnout was around 800 people, and easily more than half of those were in costume. The kids loved their first half miler, and enjoyed the trick-or-treating at the sponsor booths afterwards. Great job everyone! Those are all on Saturdays, and all those links go to my race reports from last year - so you can get an idea of the courses. So get some of these on your calendar, and we'll see you out there! 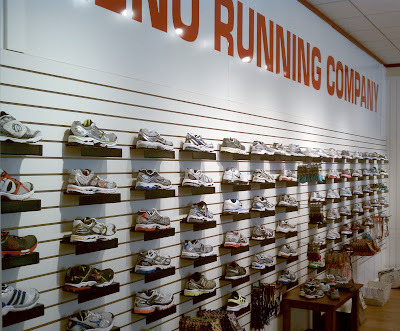 "The event will feature 8-kilometer and 2-mile runs and 2-mile walk through the city's historical district, all starting from the corner of Telegraph and Curry streets, across the street from the Carson Nugget." 8K starts at 8:15, the 2 milers at 8:25. Sponsored by the Carson Nugget, Ascent Physical Therapy, CV Sports, Dutch Brothers and Round Runners Club of America, and benefitting the Special Olympics. "Dress in costume for the 2nd Annual RENO 5000 "Trick-or-Treat" 5K Run/Walk and Haunted 1/2 Mile Dash! Run/Walk and Haunted 1/2 Mile Dash! 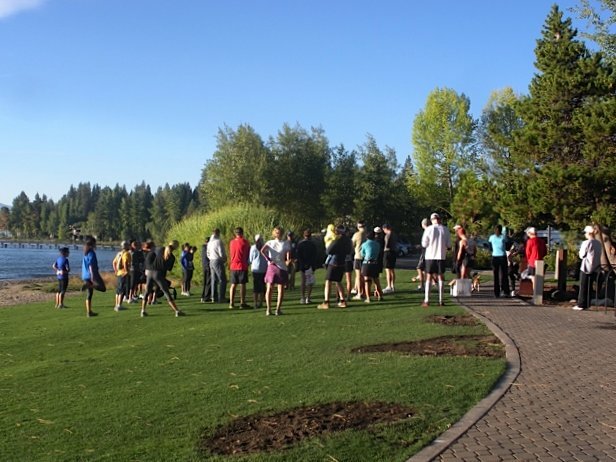 Show your support for the Sierra chapter of Girls on the Run by participating in a fun 5K/10K up in Truckee. 10K starts at 9:30, 5K at 10:00. 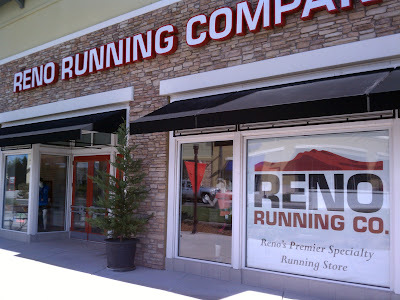 Last weekend, I had the opportunity to drop in on the newest running store in town - Reno Running Company, located in the Summit Sierra Mall at the south end of town. 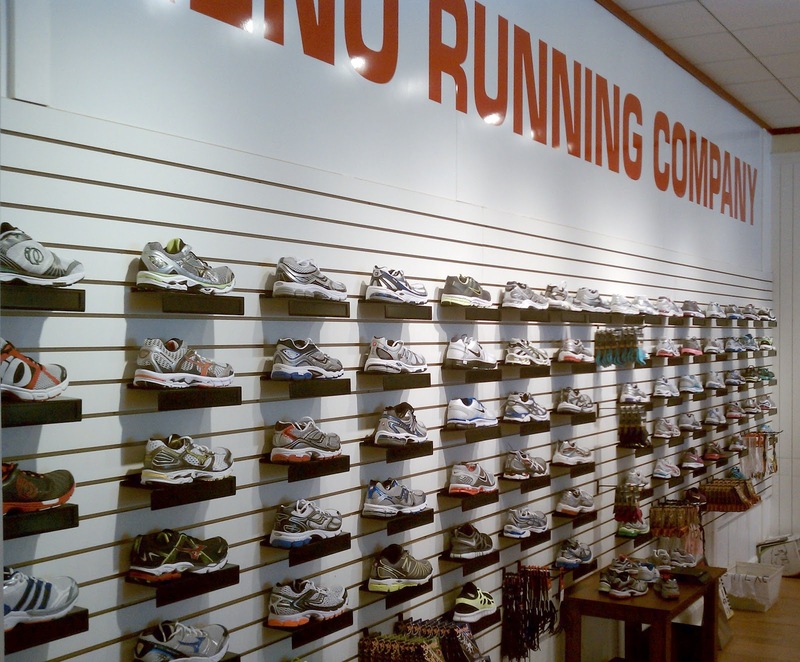 The new store was opened by local triathlete Matt Balzer, and is patterned on the popular and successful Boulder Running Company stores in Colorado. The store is set in the middle of the Summit complex, kind of in between the main strip mall and the movie theater area. It's easily identifiable, and there's a small parking lot out front as well as a larger one in back. 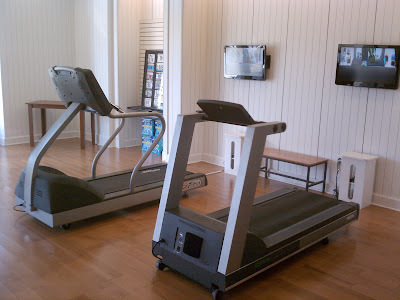 A great feature of the store which I didn't have the opportunity to test out is the two treadmills they have for testing out shoes. These are both fitted with some video capabilities (the screens behind them) to assess peoples strides and foot strikes. Pretty cool, and I can't wait to take advantage of that technology at some point. So, definitely worth a visit. The store's website isn't quite up and running, but they are pretty active on their Facebook page, so check them out there. Last year around this time, I suggested that people use their "fall back" hour from the Daylight Saving switch to do something healthy, like go run. 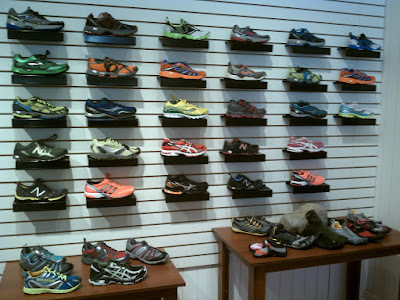 This year, there's an even better option - do a race! 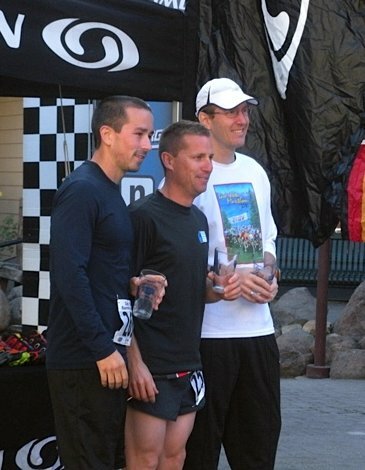 The Anytime Fitness Anything is Possible 5K is going to be put on Sunday, Novermber 6, 2011 - at 1:50 AM. That's just before the time that the clock switch is supposed to happen - so really, the whole race will happen during that extra hour that doesn't really exist. This will allow everyone to run a negative time - if you run your 5K in 25 minutes, say, you'll start at 1:50 and finish at 1:15! 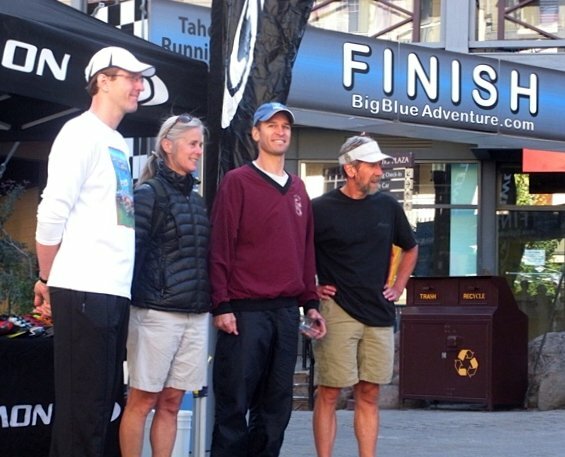 The UNR campus will be the setting of the race, with the start and finish near Mackay Stadium. The course heads up to the north side of campus before heading south, looping around the quad, then back north to the stadium. 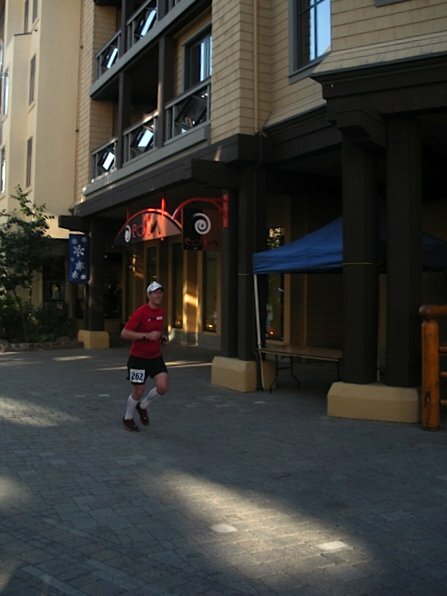 Across the street, the Little Waldorf Saloon will host both the packet pickup and breakfast after the race. There are also Anything is Possible races going on in Seattle, Denver, Washington, D.C., Atlanta, Virginia Beach, Nashville, Austin, and Viera, Florida, at the same time. 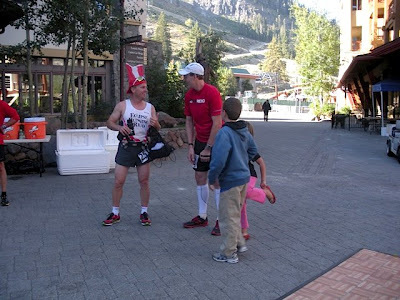 The director of the local race is Eric Lerude (who puts on the Reno-Tahoe Odyssey) so you know it's going to be a quality event. 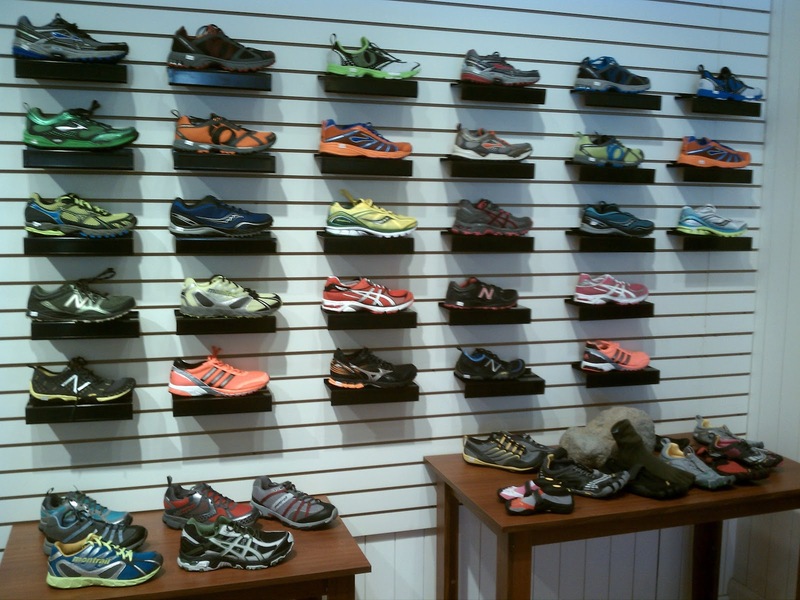 The race series has two national charities and a local one that it benefits. Nationally, it benefits Team Red White and Blue and Hope For The Warriors. The local charity for the Reno event is the Nevada Military Support Alliance. Follows the second half of the Bizz Johnson Marathon, run on Sunday. 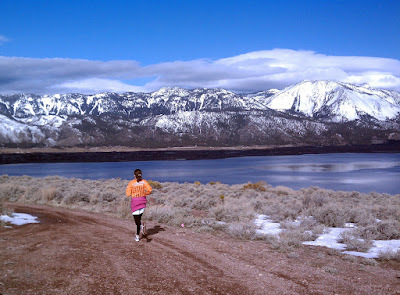 After being bused to a remote start, you'll run all downhill back towards Susanville on the converted railway grade. 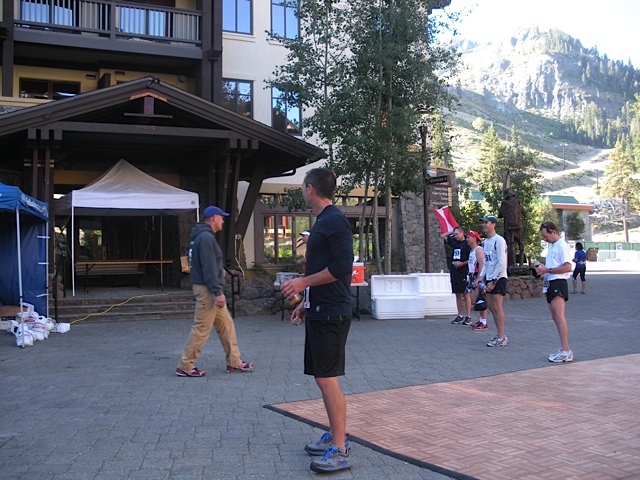 The main race day, featuring an overall downhill marathon, and an out-and back half marathon and 10K. On the gentle packed dirt trail of the Bizz Johnson trail system. 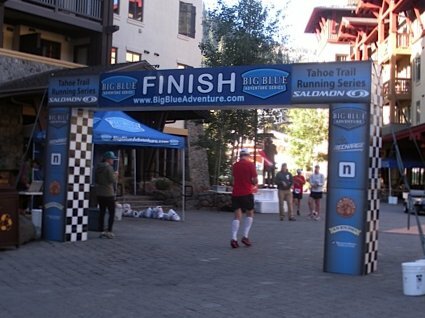 This last Saturday was the Oktoberfest Trail Run - the final event in Big Blue Adventure's series of runs this summer, and a return to the same course that the Run to Squaw was held on in June. For that race, I had the company of Team Library Dork members Chris and Dave, but they are both pretty severely gimped out at this point, so I was running solo. My mom happened to be in town, though, and she brought my kids along and took most of the pictures here. Thanks, Grandma Gail! 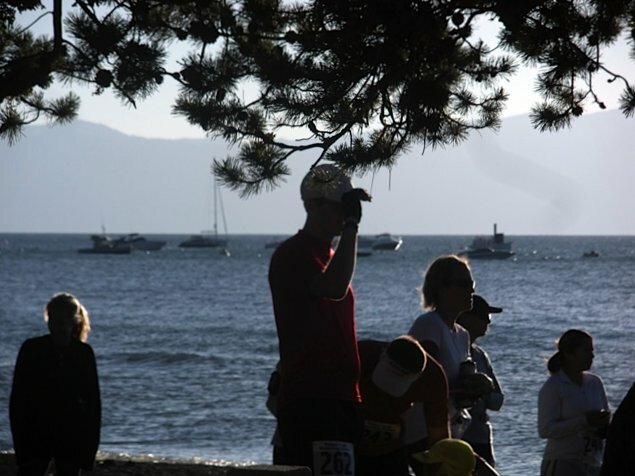 We got the kids up early enough to make it up to Squaw, pick up the race packet, and get down to the start line at Commons Beach in Tahoe City. (The same place that the Tahoe Marathon had started just 6 days before - kind of weird being back there so soon.) There si a nice little playground there, so the kids were happy playing while I did a couple short warm-ups. Felt pretty good, ankle and cal not bothering me too much. Almost immediately out of the gate, my ankle started hurting. 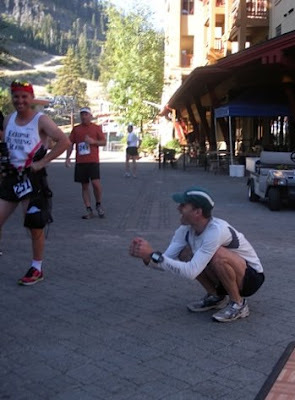 It had behaved pretty well through the Tahoe Marathon, although I think I was favoring it, which in turn make my calf do some pretty awful cramping. Similarly today, once I felt the ankle starting in, I adjusted somehow, and started feeling my calf as well. Nice. But within half a mile, I had fallen into fourth place, with third way ahead of me. I could hear a couple people behind me for awhile, but they eventually dropped back. On one short little switchback section that got us up onto Hwy. 89, I could see how far back they were - close enough that I was worried about it for the rest of the race. That one switchback, by the way, was the only change in the course from the Run to Squaw, and it was a good one - it eliminated a dangerous crossing of the busy road. Making the turn into Squaw, my mom and the kids were waiting to cheer me on. I was glad to toss them my gloves, as it had warmed up more than I had anticipated. I then watched my mile splits climb as the elevation also climbed slightly. Again; worried about the people creeping up behind me. 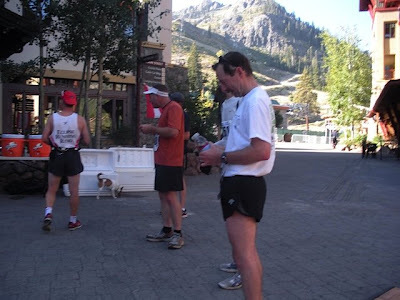 As I made the turn into the Squaw parking lot, maybe 600M from the finish, I finally risked a look behind me - and didn't see anyone. That was a relief - I didn't have to push too hard up the final hill into the little mountain village and the finish line. Stopped my watch at 55:38. Official race time was 55:46 - close enough. Funny, there was about a minute separating each person, first through fifth. Congratulated the race winner, Chris Barber, and then threw some sweatpants on and hung out for awhile. Apparently my daughter likes taking pictures of dogs. At the low-key awards ceremony, I picked up a 2nd place pint glass to go with the clutch of 3rd place ones I've collected this year (I had a 2nd Age Group at the Run to the Beach, but had to hurry out of there before the awards.) Then the did the series awards, and I was surprised to hear them call my name. I had figured that Chris Barber had overtaken me on this race with his win. In fact, he had, but since the series prize (a pair of Salomons) was the same as the prize for winning today's race, apparently he was OK with letting the series prize go my way. Thanks, Chris - owe you a beer sometime.